There are a lot of acronyms floating around in the nonprofit universe in which I work. Some of them come from the corporate world, in which I also once worked. In January, that two-faced month which looks both backwards and forwards, goal-setting acronyms can easily creep into people’s personal lives. In my last post, I used one myself: BHAG. 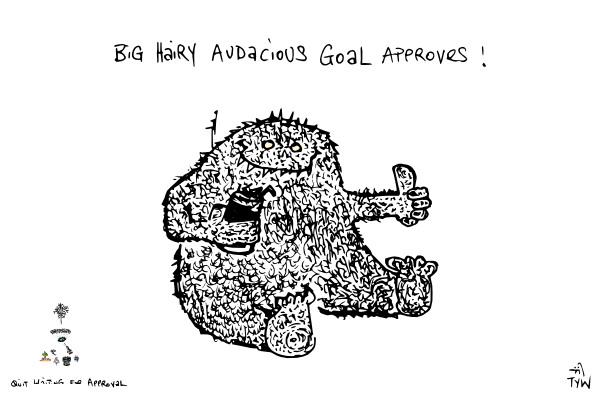 BHAG stands for “Big Hairy Audacious Goal.” It comes from Built to Last, a 1994 business book by James Collins and Jerry Porras. A BHAG is a visionary goal that is emotionally compelling and challenging enough to stimulate people to work toward it. Nothing is too hard, problematic or risky if the BHAG is genuinely worthwhile. 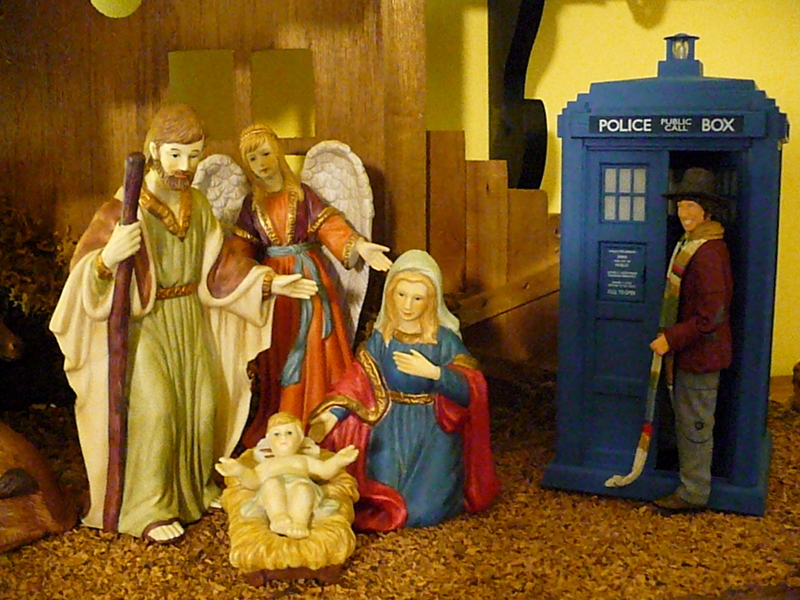 My BHAG is to be a Time Lord. OK, so I haven’t watched Dr. Who regularly since Colin Baker had curls, but who doesn’t want to be able to move backwards and forwards in time in a contraption that is bigger on the inside than it is on the outside? Who doesn’t want a life that is bigger on the inside than it is on the outside? Let’s face it. Every creative with a day job wants this. Still, it is hardly the sort of thing one resolves to do. So perhaps I should focus on that other goal-setting acronym, the SMART one. This is the problem I have with a lot of time management tools aimed at increasing productivity. There’s too much emphasis on on squeezing as much as possible into each day, using every waking moment as efficiently as possible. And yet I still find time management and productivity tools very seductive. With David Allen’s Getting Things Done, the explicit promise is “stress-free” productivity. Collect all your tasks in one place, then process, organize, plan, and do them. I worked the GTD system for years, and it has much to recommend it; but as many other people have noted, it is easy to get so obsessive about collection and categorizing and breaking things down into actionable steps that the system itself becomes overwhelming. It also works best for executives who have people they can delegate tasks to. I don’t have people. 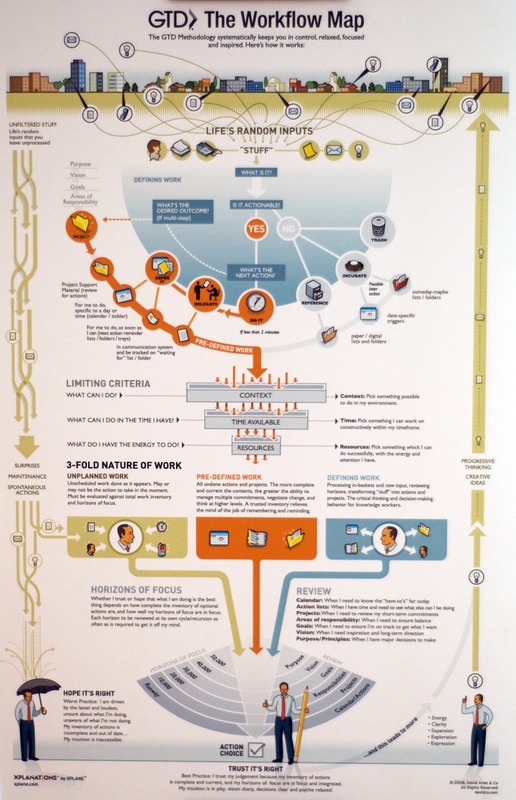 Note that the only woman on this workflow chart is the Executive Assistant. She’s part of the collection process. Steven Covey’s First Things First, co-authored with A. Roger and Rebecca R. Merrill, proved to have more lasting value for me. 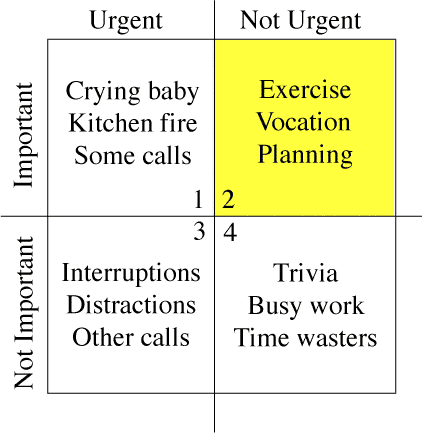 Figuring out how to do more of what is important but not urgent is the real BHAG here. The trick is to find out what sort of SMART goals would make that possible. And now I have a SMART goal for 2015 as well. To spend an average of 20 hours a week on creative work – significantly more than I’m managing now, but not, it appears, impossible. Do you have a Big Hairy Audacious Goal for your creative life? Do you know what SMART goals you need to move toward your vision? Good look with your big hairy goal! I’ve learned not to have those BHAGs via the SOHKs – school of hard knocks! Best of luck with all your goals, small or large! Ah, the SOHK. I never learn anything there (sigh)… Thanks for the luck, Jan, I’m sure I’ll need all I can get! We swim in a sea of acronyms, don’t we? I’ve used Logic Models and SWOT, as well as SMART and the URGENT/IMPORTANT Matrix–Eisenhower used a version of that matrix, but is also famous for his quip that “Plans are worthless, but planning is indispensable.” So, I suppose the takeaway from your great piece is that virtue resides in the process of trying–whether or not we actually realize the goals we set. Thanks for the thoughtful post. Yes, it is a sea of alphabet soup. Thank you for the Eisenhower quip – I know I have heard it – every time I’m in an organization that goes through strategic planning, but wasn’t sure who said it. I’m glad you had a takeaway, Anna. Reading your post makes me want my BHAG to be learning to use good pictures and gifs in my posts. You always use such great ones! Thanks Ariel. That’s one way, for better or worse, that Twitter has shaped my blog posts. I like to have six different lede lines to tweet, with accompanying pictures; that also makes it super easy to find my posts in the stream and track who is retweeting them so I can reciprocate. It started out as a promotional thing, but now I’ve really gotten into it for its own sake; I think that’s my frustrated visual artist finally coming out to play. I chuckled at all of your illustrations, Paula. Loved it! Your point is a viable one, and I’m glad your system works. Your post was great and I agree that URGENT must be defined to ultimately not be stressed during productivity. I “get” how those workflow charts become a stress within themselves. I’m like you in wanting a more reasonable approach to individual goals. Nothing good come from stress! Wow, Laurie, I’m impressed. That’s quite the system. I’ve not used a Howler timer before, and had to look that up. Anne’s link in the comment above to Charli Mills’ post also has some interesting ideas for setting goals for writers. Love this post. At one time I spent so much time chasing personal development “strategies” that I ran out of time for personal development. Having found one that works best for you is awesome. I know habits are the key. Why do I resist structure like a kid resists brussel sprouts? Once I answer this – I’ll turn into a time lord. 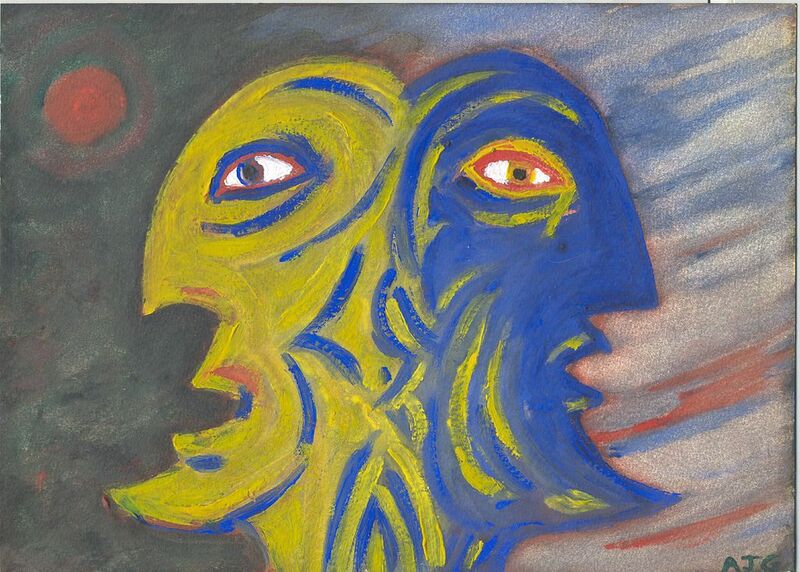 I’m here through the #MondayBlogs tag on Twitter and have been meaning to comment since the 12th. This post is helping me evaluate my methods for achieving my creative goals this year. I’m failing so far, and it’s frustrating, even keeping in mind that a component of my overarching goal is to experiment with various time management methods to find what works best for me. I love the idea of a BHAG goal! That particular piece of terminology helped crystalize some things for me. Thanks for posting! I’m glad I clicked through. Thank you so much Kate. I’ve been meaning to reply since the 14th! I’m very glad to see that it prompted a post of your own as well. Now I feel bloggy famous. Thank you, Kate. And experimental as well, because I have no idea if this comment is going to show up on your blog as well as mine. Am about to trip over to your blog and find out! Increase the number of hours in the day!? Lord, I’ve always been happy with myself when I make lists and sort of stick to them. You leave me in your dust. I hope you get your 20 hours a week. Good luck! Oh dear. Dust. That creates chores on my homemaking list. As I told Norah, I did manage to get in those 20 hours last week, but it was at the expense of other things like matter, like timely responses to blog comments. Thanks for stopping by Judy. So – what is YOUR Big Hairy Audacious Goal? Thanks for sharing my BHAG on your blog, Steve. Much appreciated. Thanks for sharing my post, Fred!